He said that PMF “benefited greatly” from Hezbollah’s support, who played a “central” and “very important” role in the PMF’s battle-readiness. 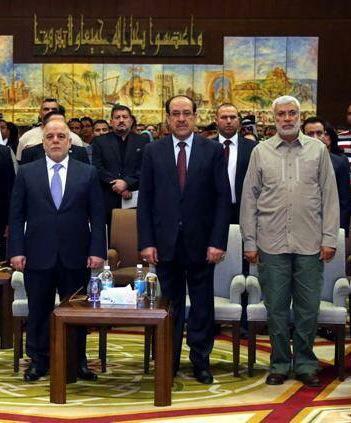 Muhandis said “the brothers in Hezbollah” sent advisors to Iraq from the beginning of the battles against ISIS. Along with Iran, Hezbollah helped the PMF “with training and planning, and with weapons and equipment.” However, he also hinted that Hezbollah’s role may not have been exclusively advisory, saying that the Lebanon-based Shiite group “offered martyrs” on Iraq’s battlefields. 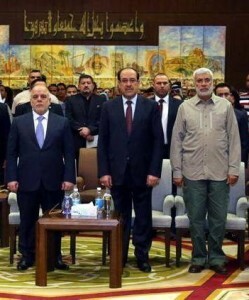 Muhandis (right), pictured with Prime Minister Abadi and former Prime Minister Maliki. The relationship between the PMF and Hezbollah, Muhandis noted, was not merely one of solidarity against their common foe of ISIS, but as with the PMF’s relationship with Iran. They consider the Lebanese Shiite group a “friend, ally and partner in the region.” He noted that with the consent of the Iraqi government, the PMF would continue its relationship and alliance with Hezbollah beyond the battle for Mosul or the immediate fight against ISIS. On a personal level, Mudandis said he was “honored” to have a “long-standing” relationship with Hezbollah’s Secretary General, Sayyed Hassan Nasrallah, whom he called “master (sayyed) of the Resistance” and a regional symbol. He also spoke of his long-standing personal relationship with two of Hezbollah’s storied founders and former military commanders, Imad Mughniyeh and Mustafa Badreddine, whom he called “the great martyrs.” Describing his relationship with the two late commanders as “firm and operational,” he said Mughniyeh and Badreddine were the first to come to Iraq in the early 1980’s to train “Iraqi [Shiite] jihadi rejectionist groups,” to fight Saddam Hussein. Beginning in the 1980’s and for years afterwards, Muhandis – born Jamal Jaafar Mohammad Ali Aal-Ibrahim – worked alongside Iran’s Islamic Revolutionary Guard Corps (IRGC) and its Iraqi proxy Badr Organization. Along with Badreddine, Muhandis was part of the militant group Dawa 17. They were involved in the 1983 near-simultaneous bombings of the US and French embassies in Kuwait, the Kuwaiti airport, the Raytheon Corporation’s headquarters, a Kuwait National Petroleum Company oil-rig, and a government-owned power station. The attacks killed five people and injured 86. Along with Badreddine, Muhandis was also linked to the 1985 attempted assassination of Kuwait’s emir. 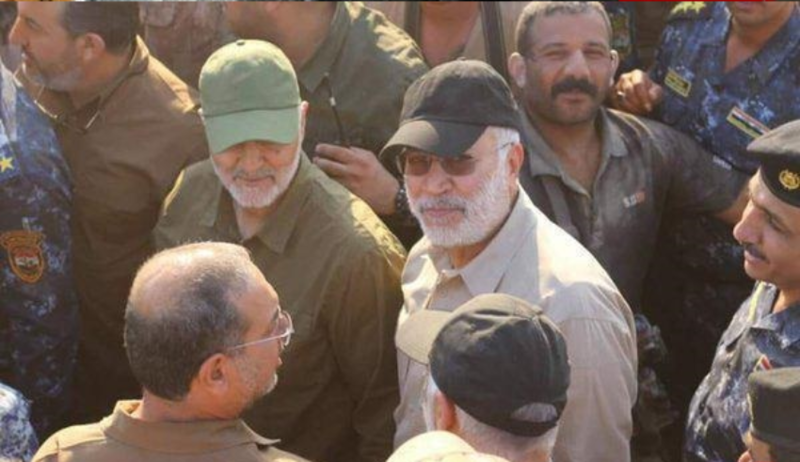 Muhandis recalled that after 2003, Badreddine and Mughniyeh returned to Iraq to “train, aid and prepare” Iraqi Shiite militias against US forces in Iraq, himself included. At that time, Muhandis served as the leader of Kataib Hezbollah, an Iranian-sponsored Shiite militia which carried out deadly attacks that killed hundreds of US troops in Iraq. He helped smuggle improvised explosive devices in from Iran and Hezbollah. Known as explosively formed penetrators (EFPs), those explosive devices were the primary killer of US troops in Iraq from 2003 to 2011. As a result, Muhandis was listed by the US government as a specially designated global terrorist in July 2009, and was described as an advisor to Qassem Soleimani, the commander of the external arm of Iran’s Islamic Revolutionary Guard Corps, the Quds Force. Muhandis also spoke of the PMF’s relationship with other countries and groups. Most important among those was with Iran which, along with Hezbollah, served as the “cornerstone” of support for the PMF, supplying them with “weapons, ammunition, [battle] planning and advisors.” He said that though the PMF now purchases weapons from the Islamic Republic and Hezbollah with Iraqi government funds, in the past both Tehran and the Shiite group gave them aid freely and “with great generosity.” He also noted that while the Americans did not aid the PMF in the battles to defend Irbil and Baghdad, the Iranians did. He stressed that the PMF neither wanted nor needed a relationship with the United States. However, they do want peaceful relations with Turkey and have open communication with the Russians. He said Moscow had placed intelligence assets and the representative of the Russian Defense Minister in Iraq. He noted that the head of the PMF, Falih al-Fayyad, was on a trip to Moscow at the time of the interview and that talks were underway for Russia to arm the PMF. Muhandis denied the presence of PMF fighters in Yemen “in an official manner,” aiding the Houthis, whom he described as “brothers.” However, he did say that, “there could be Iraqis there in one capacity or another,” and confirmed the existence of political ties between the PMF and Ansarullah. Muhandis also said that after the battle for Mosul and Iraq, his fighting groups would “go to any area that threatens the security of Iraq.” Then, with the consent of the Iraqi and Syrian governments, PMF intended to “fight ISIS” in Syria, noting the presence of Iraqi Shiite militias fighting on behalf of Bashar al-Assad. He also stressed the “constitutional and legal right” individual PMF members to pursue political careers. Erdogan is backing off support for FSA and moving back to IS, don’t believe me watch al-Bab, the deal is IS to lighten up and swing in behind the establishment in both Syria and Iraq, the only losers are the Kurds, if this deal fails IS joins PKK. And that just confirms that we should be, and should have been bombing the snot out of ALL of them. If Muhandis and his little buddies think Russia is soooo great, by all means, they can have them. The absolute last thing any one in the US military should be doing is providing ANY kind of cover, or support of any kind to these scum. And, since the Iranians and Hezbollah have such a cozy relationship with the PMF and by extension the Iraqi Army and government, that applies to them as well. We shouldn’t be lifting a finger to help any of these scum, and arguing or actually doing anything to the contrary is flat out treason. We should be bleeding them dry, throwing up every obstacle possible, making them pay in blood for the murder of my brothers, and sisters at the hands of the mullahs dogs. the day US goes to war with PMU/Hezbollah is the day they start cleaning the Grand Mosque in Saudi & Palestine . wanna play games no problem US will forfeit any hand it has in Iraq. The U.S. forfeited any “hand,” it had in Iraq, when we pulled everybody out, without leaving a considerable detachment of direct action, intelligence, advise and assist, or combat troops, amongst others. We gave it to the Iranians when we left, and outside of the embassy detachment, had no boots on the ground. My people were lied to about why we went to that war, and we were lied to about why and how we left that war. Cities that were protected and defended by my brothers in arms for years, at great cost, were lost by Malikis phantom Shiite army overnight. My people deserve better than our government, and my brothers deserve better than to have their sacrifices made in vain, and all of our blood, sweat and tears disregarded and disrespected by uncaring, unknowing bureaucrats. Do I want to play games? No Zurba, I want to take my ball and go home.